Arms were not the property of a family, but of an individual. Those adopted by generations of the Marten family, latterly of Marshalls Wick House, were devised for John Marten, living in 16th century Oxfordshire. The formal citation of the pictorial arms describes them as, "sable, three oval buckles, fesseways two and one argent, and the crest is a martin, sable, holding in the beak a buckle, as in the arms." 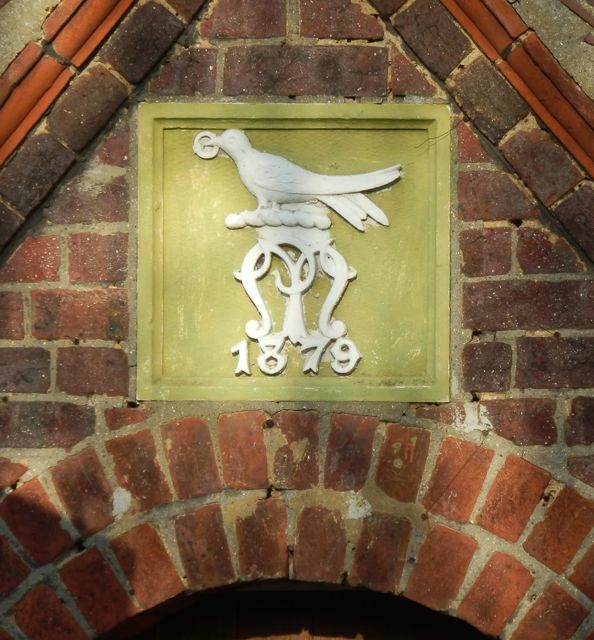 Representations of the arms are still to be seen in the front elevations of the estate lodges in Marshals Drive and Marshalswick Lane, as well as Freelands Cottages in Coopers Green Lane. Although not the first company to use the premises in Campfield Road, the Salvation Army certainly left its mark. Initially, the premises had just one entrance, but the addition of the instrument works prompted the owners to install wide gateways with a unique imprint set into the coping stones. 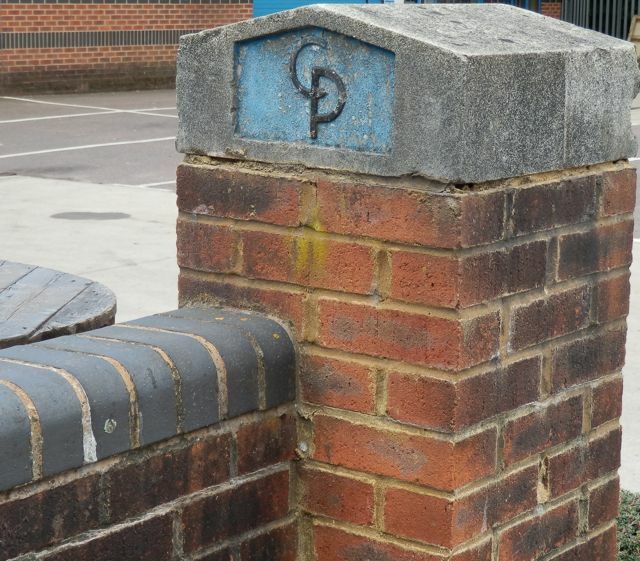 The building is no more, having been replaced by a collection of modern 'Unit' industrial buildings, but the gateways, with their original gateposts, remain: at some point painted blue and black to make them stand out. 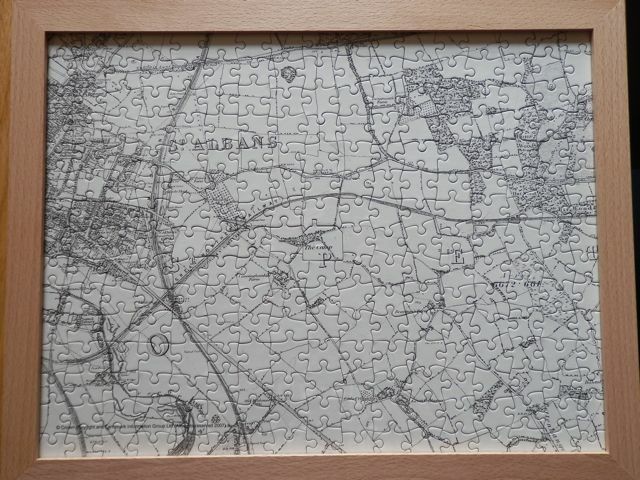 Although a modern leisure artefact, this jigsaw in its modern frame has, inside it. a copy of an Ordnance Survey map c1885. The city is over to the left; the two-decade-old railway slices through the outskirts from north to south, with the Great Northern branch snaking broadly west-east. At this date there is no Fleetville, Camp or Marshalswick; just isolated farm houses and the occasional hamlet. The object, appropriately, links pre-East End with the modern era. Charles Wimbrey, states that he had admitted 65 children. 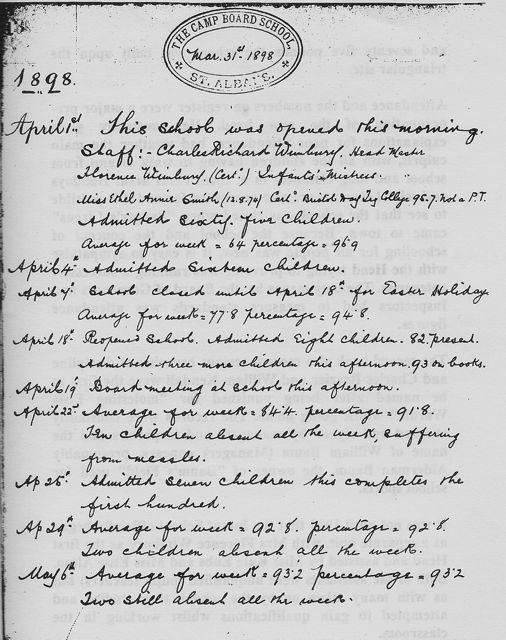 On the 22nd he reported: "ten children absent all week, suffering from measles." Later head teachers would note details of key events in the life of the school, results of inspections, visits made by classes to the wider world, and inevitably, the behaviour of groups or individual children. Although the panels on the front of these homes are a fixed part of the buildings, and therefore not separate objects, they began life as separate tiled products. Among the earliest dwellings in the district of Fleetville, Mr Alfred Nicholson had a number of small homes built for a group of employees at his nearby coat factory; the factory and employees brought here from Manchester. 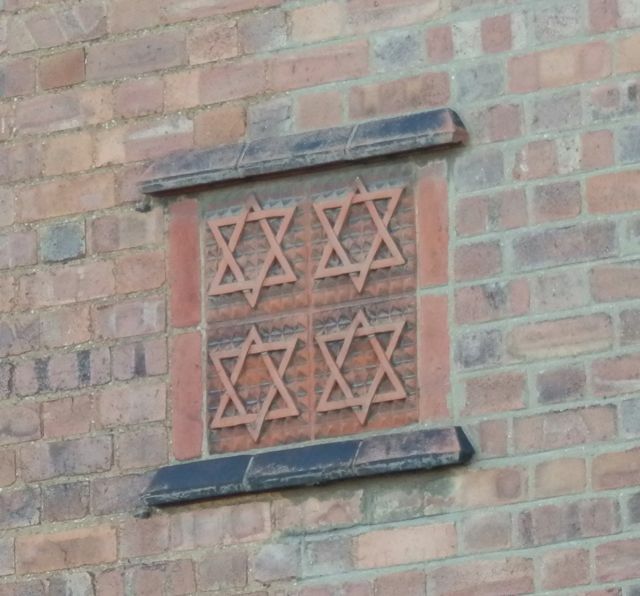 The design suggests they were dedicated for occupation by Jewish employees, as indicated by the 1901 census. Work undertaken in 2010 to restore a hospital cemetery at Hill End, also saw the recovery of a number of plot markers. At first they were set into a block of concrete, but they have since been relocated within the cemetery. The graves here are anonymous, occupied by patients who, presumably, had no-one to remember them. The burials extended from 1899 to 1948. It was tempting to specify the orchard. but an orchard is a place, rather than an object. 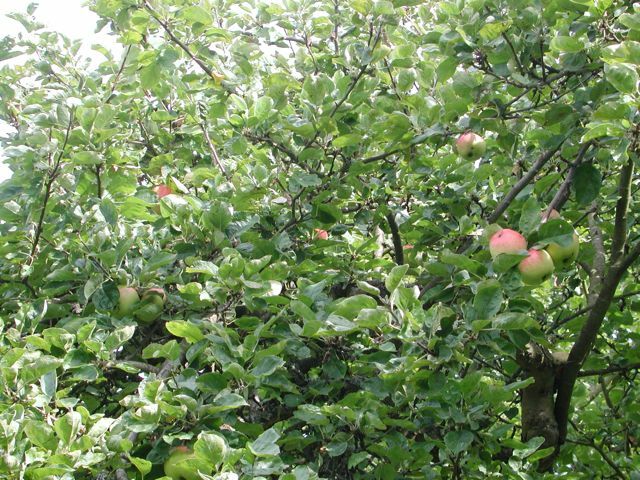 Hence, this is a single apple tree, which is representative of the dozens of similar fruit trees which grew in the grounds of most mental hospitals. Given the age of the orchards they today contain varieties of fruit not commonly found elsewhere. We might call them heritage varieties. Most of the trees continue to produce good crops of quality fruit. Such was the significance of the orchards at Hill End and Cell Barnes, it formed the basis for naming several roads at Highfield. The new electricity works was opened in Campfield Road in 1908. 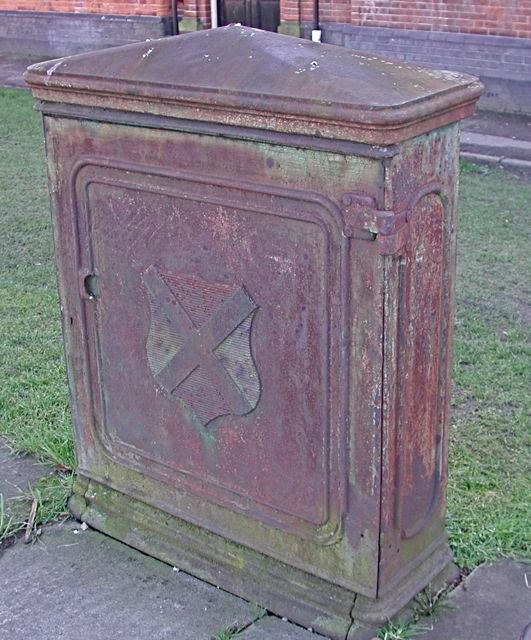 It is thought that one of the early cables was laid to this box, still standing outside the Crown Hotel, to enable connections to be made to properties within a short radius from that point. Long since redundant it is not clear why the enclosure has not been removed. More strangely, it appears to have been moved, both in (short) distance and alignment since early postard photos were taken. The door is impressed with the St Albans crest, maybe providing a clue to ownership before grouping under the Northmet banner. 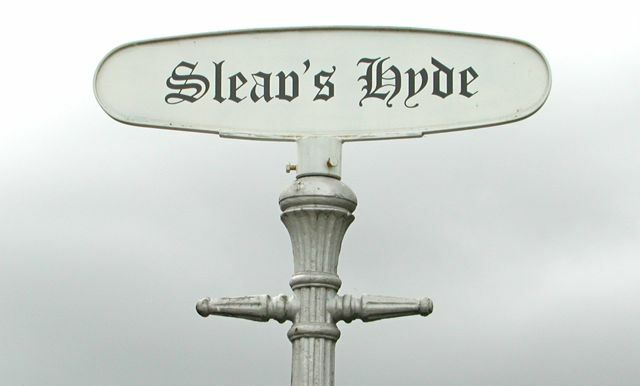 While the local areas of St Albans do not display signs announcing themselves, it is common for villages and hamlets to do so. Next to its village pump is Sleapshyde's village sign atop what appears to be a redundant street light post with its typical ladder support. 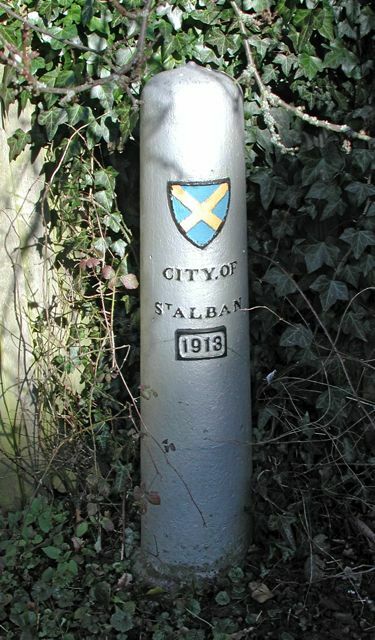 The posts east of St Albans were all cast with a blank face on the left, since their locations were only a short distance from the ultimate destination at Hatfield, as announced at the top. Later, distances to Hertford and Ware were added to the blank side faces, possibly after the winding up of the Turnpike Trust. The Fleetville post is not in its original position, having been placed next to Royal Road from Bycullah Terrace, possibly after WW2. It is thought to have been in store for some considerable time. W O Peake, the manufacturers of coats, arrived to take up a small building in Hatfield Road, and within two decades had created a magnificent building extending from Granville Road to The Crown. This product example was acquired by Juliette Kimes, who knows that the lady who originally purchased it met her husband in England during WW2, and emigrated to the US. The label informs us that is is made from 100% new wool. The company's products were sold in quality stores and shops in the UK, and were exported widely. One of several adventurous items of children's play equipment purchased by the council for Clarence Park; this being one of at least two purchased for open spaces. Another is remembered at Cunningham. 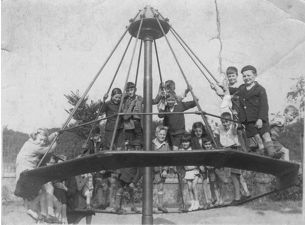 It generated huge amounts of enjoyment, but was prone to mis-use at times by groups of older children who crowded on, spinning and rocking it violently. The apparatus was also known as the Witch's Hat. It was eventually removed, probably for safety reasons. Source unknown and thought not to have been from St Albans. Since the development of Fleetville the city had been planning a boundary extension to encompass the new suburb, an act it was empowered to do in 1913. 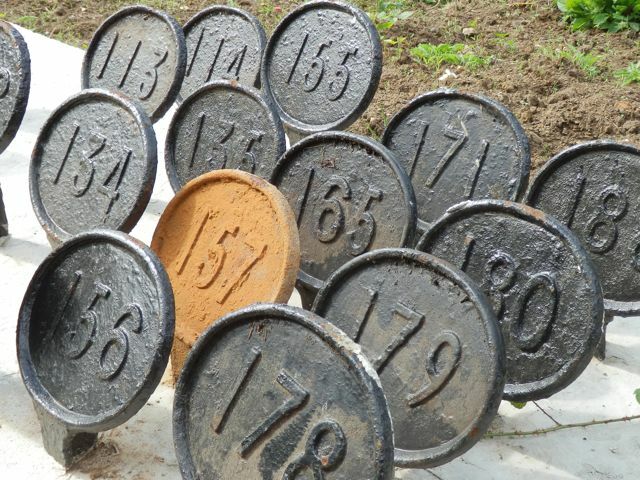 A number of markers were erected along roads around the city to signify the new city limits. Although there were minor alterations elsewhere, it was on the east side where the additional acreage was at its greatest. Along Hatfield Road the extensions reached Winches; Hill End Lane was reached; and this example can be found at Sandpit Lane. The first book to be published in the modern era, about any part of the eastern districts, was this example by St Albans Museums. 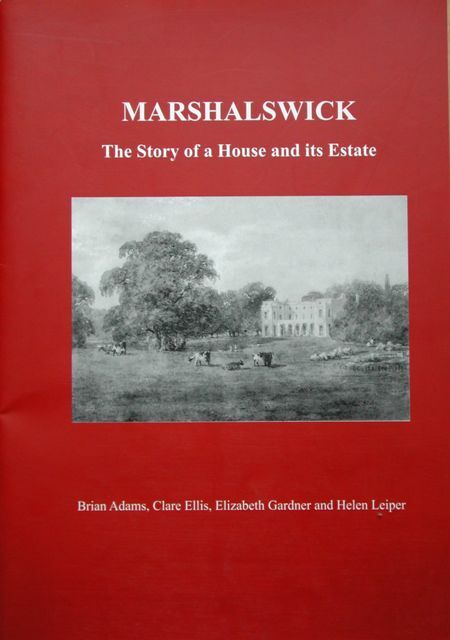 It represented a huge development in the dissemination of knowledge about the historical estate of Marshalswick. Around the country huge changes would take place, post-WW1, in the occupation and staffing of large estate houses. The book follows the occupation as a family home, and disposal of the estate and its house; while following the rise of new residential developments on its lands both before and after WW2. but here is a complete train, with locomotive and two coaches. It is waiting at St Albans Abbey Station. The name plate 'Hatfield' is fixed to the rear of the locomotive. The station's buildings are beyond the line of lamps and to the right of the canopy. 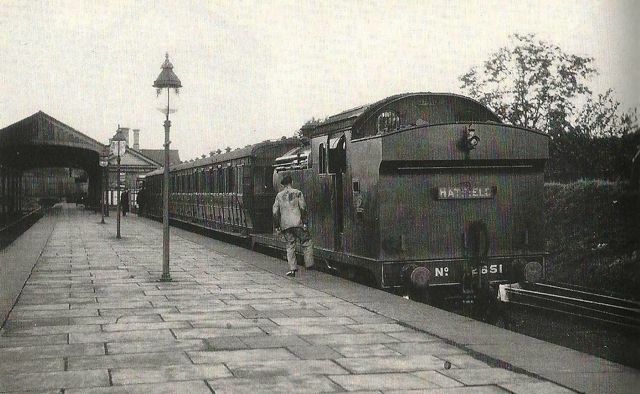 Although London Road was the company's main station, the trains ran through to Abbey Station for onward connection to Watford and Euston. Courtesy LRGP Collection, David & Charles. 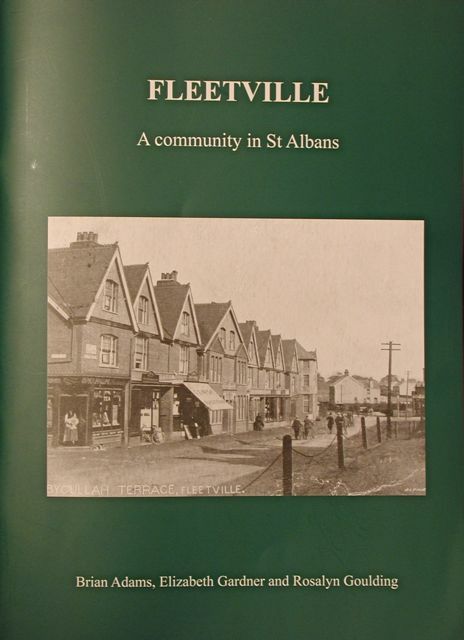 It is a credit to the vibrance of the East End of St Albans, that the Museums' second book centred on Fleetville. This time there was the opportunity to feature a number of the district's work places – Fleetville and Camp were, after all, the main manufacturing quarter of the city – as well as its shops. Small building and maintenance businesses grew up among the districts where most developments were taking place. They were quick to adapt to changing needs. After WW2 this included war damage repairs. Several chimneys, possibly not built to the highest quality in the first place, required reconstruction following a nearby bomb blast. Pipes were also vulnerable in homes with minimal insulation. £17 may have been more than a week's wages for some householders. Thousands of these bills would have been exchanged, and each told of a small trader and a job to be done. The tall cross, overlain with a sword, is surmounted on an inscribed based and double plinth. "This cross of sacrifice is one in design and intention with those which have been set up in France and Belgium, and other places throughout the world where our dead of the Great War are laid to rest." A tablet, naming the local men who are commemorated here is inside St Paul's Church. 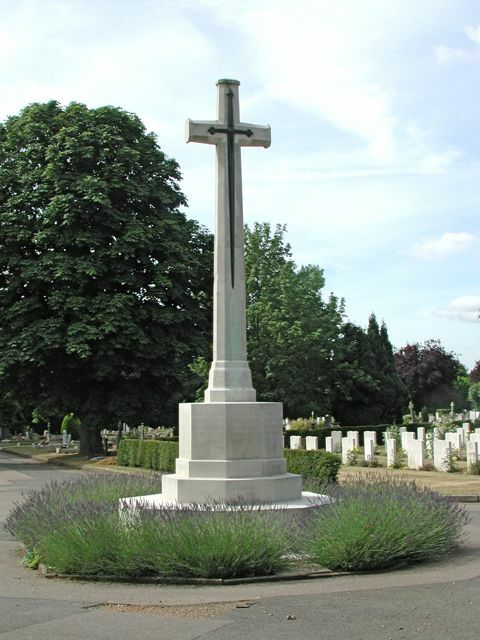 At the city end of the cemetery is a similar graveyard for the fallen of World War Two. The early years of both Camp and Fleetville were very anonymous. 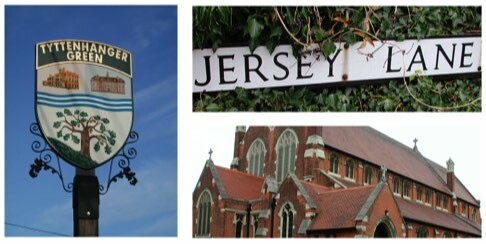 St Peter's Rural Council acceded to residents' requests to erect signs. naming the streets for the benefit of traders and visitors. The result is the blue enamel plates fashionable at the time, a few of which remain. Interestingly, the one at the lower end of Brampton Road, which was fixed to the end house as it was at the time, is now further along the road, due to the erection of another house on a vacant end plot later. 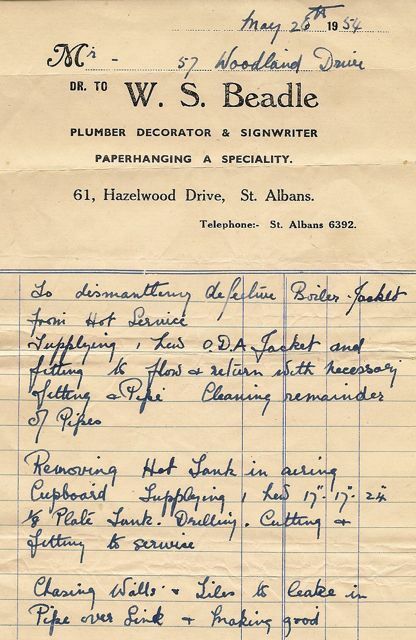 John Sheppard and his wife, Margaret, ran a bakery business from their premises at 6 Albion Road until WW1. After the war they transferred the bakery, together with a shop, to Old London Road. 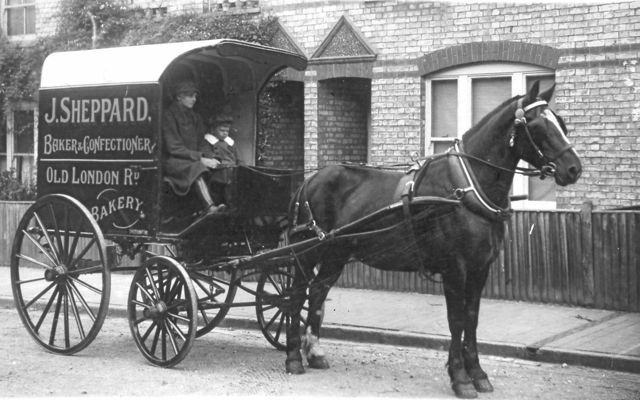 In spite of this move the company's horse and delivery cart could still be found among the Fleetville and Camp roads; one of many traders who were willing to support their customers with home-delivered food and other products.